In the midst of a seemingly endless supply of mass-manufactured products, we find ourselves nostalgic for products bearing the mark of authenticity--hand-made furniture, artisan breads, craft beers, and other goods produced by human hands. What often goes unnoticed is the transformation of our understanding of craft--or rather, craeft--in the wake of industrialization. 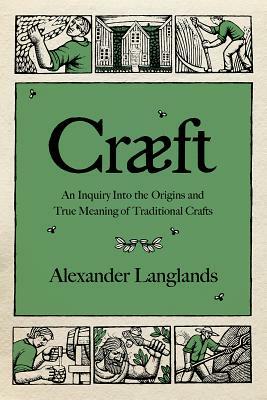 In Craeft, archaeologist and medieval historian Alexander Langlands argues that our modern understanding of craft only skims the surface. His journeys from his home in Wales have taken him along the Atlantic seaboard of Europe, from Spain through France and England to Scotland and Iceland in search of the lost meaning of craft. Reaching as far back as the Neolithic period, he combines deep history with scientific analyses and personal anecdotes. We follow the author as he herds sheep, keeps bees, tans hides, spins wool, and thatches roofs. We learn that scythes work much better on tall grass than the latest model of weed trimmers, that you can spin wool using a large wooden spoon, and that it was once considered criminal to work on animal hides before a requisite twelve-month soak. When it first appeared in Old English, the word craeft signified an indefinable sense of knowledge, wisdom, and resourcefulness. Rediscovering craft will connect us with our human past, our sense of place, and our remarkable capacity to survive in the harshest of landscapes. Craeft helps us more fully appreciate human ingenuity and the passing on of traditions from generation to generation.